It offers a pesticide-free solution with a sweet scent. It is a hands-off solution that works inconspicuously. It’s an excellent value that does double-duty as a barrier and repellent. Spiders are one of the most unsettling pests to have in your home simply because of the fear factor. Many people are scared of them perhaps because of a traumatic encounter as a child. All produce venom to kill their prey, but not all spiders are dangerous to humans. However, they are often a secondary problem that follows an infestation of other insects on which they feed. Spiders often are a continuous problem with new populations appearing in your home each fall. Understanding their habits and habitats can offer vital clues to ridding your home of these invertebrates. Often a multi-faceted solution provides the maximum effectiveness to both repel and kill the pests. Our Top 4 Best Spider Repellents 2019 review looks at one part of your line of defense with products that will provide an effective barrier to them. Keep reading to learn the ideal ways to use them to get the results you need for your peace of mind. How Do Spider Repellents Work? Are They Safe to Use Around Children and Pets? 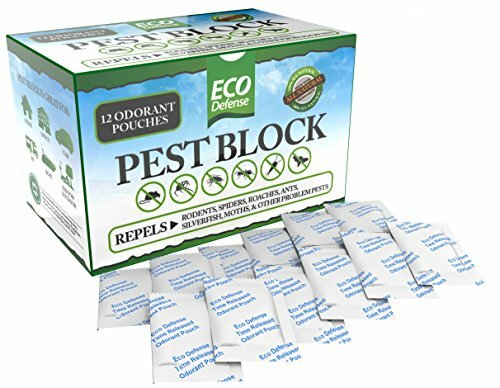 Eco Defense Pest Control Pouches rely on the repellent effects of aromatics to keep spiders from invading your home. It’s safe to use if you have pets or small children because they don’t contain any pesticides. Each packet protects up to 10 cubic feet of space. 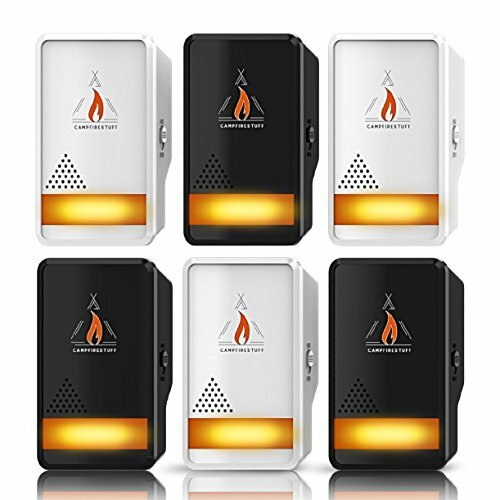 They are easy to use without the unpleasant odors of comparable products. It’s a hands-off solution without the hassle of other measures. There’s no risk of staining too. It’s a viable alternative to other insecticides. Campfire Stuff NEW 2018 Ultrasonic Pest Repeller works electronically simply by plugging it into an available outlet. It is safe and without the mess of some repellents. There is no odor with this environmentally friendly solution. It won’t disturb pets including birds. You can use it as a nightlight too. It is for indoor use only. The product description touts its use with other pests too. However, the effectiveness varies with the species. 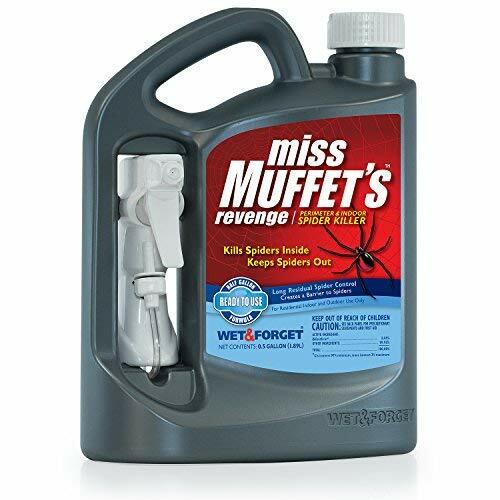 Wet & Forget 803064 Miss Muffet’s Revenge Spider Killer offers an excellent value because of the other uses it has. You can apply it as a perimeter defense around your home or at entrances within the house. The ingredients are effective and quick-acting against a wide range of pests which adds to its usefulness. It’s essential to read the label and use it precisely as directed. It is toxic and can affect other organisms too because it is a broad-spectrum pesticide. Star Brite Spider Away Natural Spider Repellent offers another non-toxic way to keep spiders and other pests away from your home. Like comparable products, it relies on the aromatic properties to deter them. It is safe to use around children and pets. It won’t stain, but it has a noticeable scent that dissipates quickly. You can use it indoors but use caution outside because of its potentially harmful effects to plants. Some species like brown recluse present a real health risk if you get bit even if there are no documented fatalities in the United States. It’s wise to act on a spider problem as soon as you’ve noticed signs of an infestation. Some species like brown recluse present a real health risk if you get bit even if there are no documented fatalities in the United States. Generally, they are not aggressive and will not attack you. However, wolf spiders may act if they feel threatened. They rely on venom to kill their prey. The degree of its harm varies with the species. They are successful creatures from an evolutionary perspective and have existed for over 300 million years. It says a lot about their tenacity and the steps you’ll need to take to rid your home of spiders. Since they often accompany other insect pests, it makes sense to use a repellent along with other control measures. Spiders can enter your home through the smallest of openings, making repellents an excellent choice with an added degree of assurance. Repellents are generally non-toxic solutions that rely on the aromatic qualities of their ingredients to deter spiders and often other pests too. The advantage of using them is that they typically don’t have the strong, undesirable smell of other products yet provide the protection that you need. The residual effects vary with the concentration of the ingredients and type of product. Essential oils, for example, are volatile compounds and tend to dissipate quickly. That means their effectiveness is limited. However, they are safe to use which is often the deciding factor when dealing with a pest problem. The question of safety boils down to the active ingredients of a product. Its description provides several clues to help you get to the answer. If it mentions anything about killing the pests, then you know that the spider spray likely contains a pesticide which can pose human health or environmental risks. It’s imperative to read the label of anything you intend to use before applying it. It must contain everything that you need to know to ensure its safe use, particularly if it is EPA-registered. Don’t deviate from this information at all. The manufacturer has taken the pains to test them to ensure minimal harm when used as directed. Spiders often indicate that you have more than one pest problem on your hands. They typically follow the food which in this case means other insects. The best way to get rid of them is to make your home inhospitable to bugs which will, in turn, feed the predators. That means keeping the kitchen and other areas such as the spot where you put your trash can spotless. That also includes pet food sources too. Keep it in a covered container and pick up their bowls when they’ve finished eating. These precautions extend to any other structures in your yard such as the garage or shed. Spiders are notorious for hitchhiking on other items which can them transport them inside your home. Also, drain any sources of pooling water which can attract other bugs and, thus, the spiders too. They are opportunistic which explains why they’ve persisted since the Carboniferous period, over 300 million years ago. They live in just about any kind of environment from forests to prairies to your yard. The more barrier you put up, the better are your chances of control. Managing spiders and other pests are a part of being a homeowner. With some simple measures, you can prevent them from entering your house and wreaking havoc on your peace of mind. It begins by removing the things they need to survive, namely, food and water. The usefulness of the repellents of this kind vary. The purpose of them is for use with a comprehensive treatment plan. They may not prevent a problem entirely but can increase the effectiveness of other methods of control that you’re using. Their value comes from the fact that they are safe to use around pets and children. The risk to non-targeted species is minimal too. We suggest using them with the other measures for deterring spiders that we’ve detailed below. It’s essential to remember that dealing with these pests is usually an annual problem. Ridding your home of them is a part of normal home maintenance instead of a be-all-end-all solution.